The New One won the stanjames.com International Hurdle for a third time with a courageous front-running display at Cheltenham. With his chasing career put on hold after the abandonment of Exeter last week, The New One showed his well-being by adding this year's renewal to his wins in 2013 and 2014. Winning at Cheltenham for the sixth time, The New One (13-8 favourite) enjoyed the forceful tactics of Richard Johnson. The champion jockey was riding the Nigel Twiston-Davies-trained eight-year-old for the first time after his intended pilot, Ryan Hatch, was injured in a fall at Cheltenham on Friday. My Tent Or Yours tried to make a race of it, but The New One kept on dourly to prevail by three and a half lengths. Johnson said: "He's a lovely old horse and I'm very lucky to ride him today. Poor Ryan Hatch had a nasty fall yesterday, I'm sure he's watching frustrated but hopefully he'll be back soon. "I was very pleased to get the ride, Sam (Twiston-Davies) told me how to ride him, he said he stays well and he kept finding. He really jumped the last quick and well and he's outstayed them really. "He won here as a novice over two-five and they've always known he stays well. Maybe as he has got older he has lost some of his speed and Nigel told me to be positive. "He's been a great horse, this is the third time he's won this race and very few horses do that and keep at this level for so long. "I don't know if he will go chasing, but it was a great decision to run him today." Twiston-Davies was quick to pay tribute to the winner and also Hatch, who reportedly suffered injuries to his back and sternum in his fall. He said: "Everything worked out brilliantly, although it's a day of sadness in many ways, as poor Ryan Hatch, it would have been his ride. What a shame for him, he'll be watching this on television, I'm sure. "Andrew Nicholson (Olympic three-day eventer) has got his jumping right, he has got him going straight - you couldn't have made the running with him before, because he would have jumped to the right. "The way we rode him today, out in front - that's what he wants. He's an extraordinary horse, he cost me 20 grand and has now won three-quarters of a million. What a lovely horse. "He's only eight, and eight is young. We'll put chasing out of our minds until next year anyway. "If we can't win hurdles, we'll go chasing. 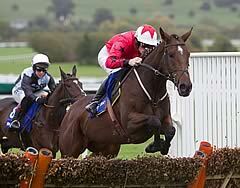 We'll look at the Christmas Hurdle and the race at Haydock (Champion Hurdle Trial) in the middle of January." Nicky Henderson said of My Tent Or Yours: "Fair play to them, it was two old warriors having a good old spar. Sure, he essentially likes good ground but so does The New One. "I can't say that the mistake at two out made any difference to winning or losing. Barry (Geraghty) said if the race was yesterday he would have been fine. "We might just keep him fresh for the spring. He has had three races since finishing second in the Champion Hurdle in brutally soft ground, at Aintree, Haydock and here."